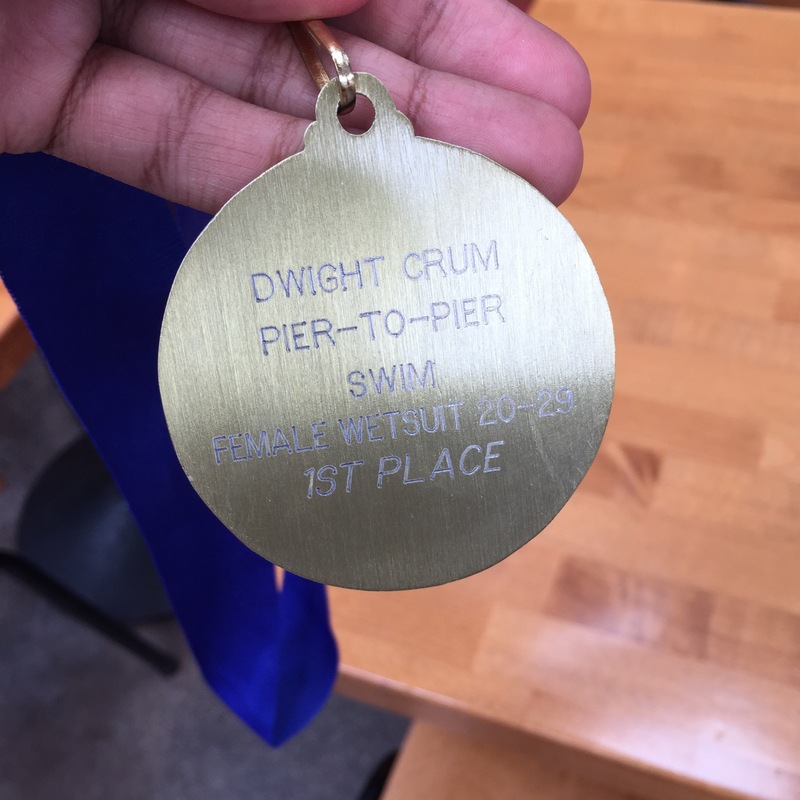 I first swam Pier-to-Pier back in 2014 during what was pretty much my second year of swimming. I remember coming into the experience fairly relaxed, and extremely excited just to be part of a swim team doing swim team things. There was no pressure and no expectations, other than to finish, and I wasn’t even concerned about that. But this year was different. I’ve always been serious and competitive, but I’ve discovered that on the path to Ironman I’ve started heaping on the pressure. It’s an easy thing to do in our sport and can be useful at times, but also detrimental. Ahead of this year’s race, I was still excited, but excited with a purpose! I’ve been swimming consistently for about four years with Tower 26 and there’s been nothing but improvement. I began to look at my time from 3 years ago as a paltry rookie time and I wanted to smash it. Race morning came quickly after a serious night run session that had left me worn out. I got up, ate my race breakfast while watching clips from IAAF Track Championships as inspiration (I know, wrong sport but it all helps), and tried to sip down a lot of water. I knew from the previous night’s run session that I was likely low on fluid, and started navigating the touchy game of trying to hydrate without over-hydrating. I parked in Manhattan Beach and took an Uber down to Hermosa. The driver was both impressed and astounded that so many of us were planning to swim 2 miles and was a great pre-race energy boost. Once in Hermosa everything progressed like silk — I met up with the Tower 26 crew, gave lots of hugs and well wishes to friends, nibbled on pre-race snacks, drank more water, and got into the zone. 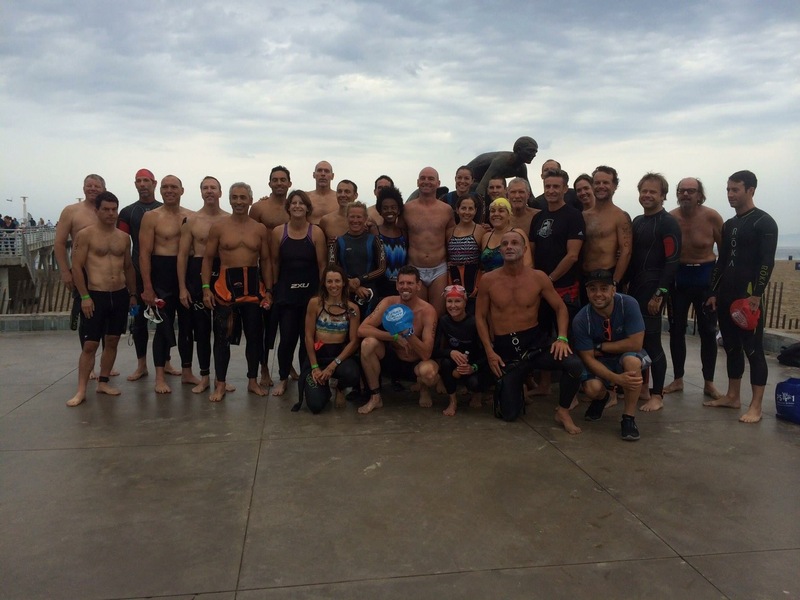 Coach Gerry sent us off for the now-familiar pre-race swim warm up and everything felt great. I had been worried that the recent warm weather and relatively high temperature of the water (low 70’s) would make for a suffocating full wetsuit swim. But the water at the edge of the Hermosa pier was cool and clean and felt fine. After warm up we made our way to the start corrals, cracking jokes, and keeping each other amped. When it comes to courses, Pier-to-Pier is about as simple as it gets — swim North. Coach Gerry had given us coastal markers to sight off of. In this case, the Manhattan Pier can appear flat and hard to see from 2-miles away, so the red and white water plant towers in El Segundo tend to be easier markers. 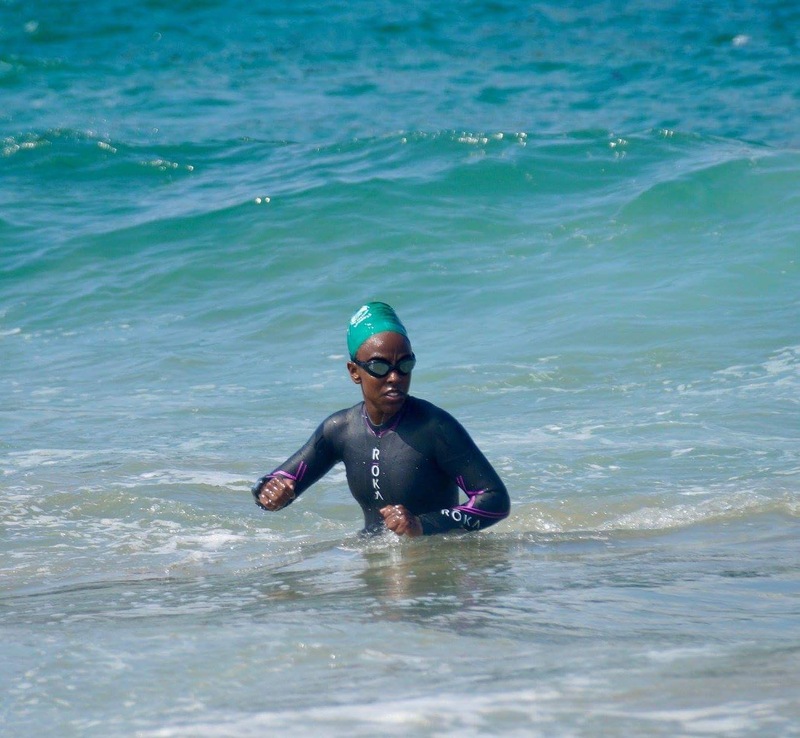 I’m not the greatest at sighting over long distances (as my 300 yard off course excursion at the Santa Rosa half Ironman revealed) but I knew that I had already made it through this swim before, and wasn’t tooooo worried about straying. The race announcer botched the group start for my wave, so after several antsy moments of waiting, our send off was fairly anti-climactic. A handful of wetsuit women were far off in the water before we were allowed to start. In hindsight, this sort of error is extremely frustrating, but I didn’t let it bother me in the moment. I started my watch and got to work. The last thing I saw before diving into the breakers was my lane-buddy Leslie waving me closer to join her and cut a tighter course. I took a breath and swam in her direction but never managed to catch her. Our orders from Coach Gerry were not to let anyone pass us. The corollary was that if we executed the race properly, then no one would. It was the sort of zen master wisdom that I’ve come to expect, but still didn’t seem fully feasible to me. Regardless, I focused on doing just that — executing my own race properly. 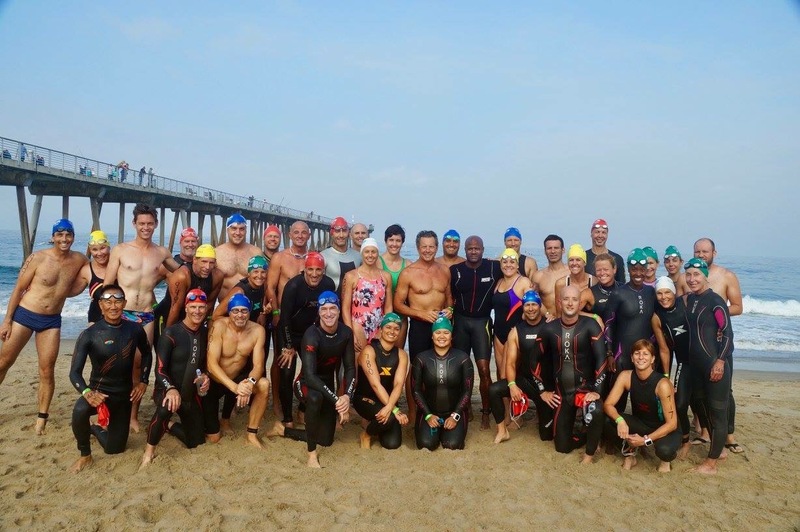 I felt fresh and warmed up after our pre-race swim and started off on the 2-mile trek. The field stayed crowded for longer than I would have expected. In my experience, swim starts begin in a mess and then thin out (also in my experience, they tend to thin out with me at the back of the crowd). But this year has been different. Whereas in 2014 I remember being alone for 90% of the swim at the back end of the pack, this year I was firmly planted in the middle for much of the journey. I followed the caps – blue caps started ahead of me, green caps started at the same time, red and white caps started behind. I passed a few blues and greens, and didn’t see too many reds and whites. After not too long, the field had thinned, but there were still plenty of bodies left and right, and plenty of feet to swim around (and over, when the occasion called for it). After a bit of thrashing and jostling up against another swimmer, I felt my timing chip come loose and stopped to check it. When I did, I was thrilled to see that my lane-buddy Leslie had somehow found me in the fray and was swimming right behind me. We managed to stick together for a solid mile. That’s when things started to go wrong. Swimming is a unique sport. After grueling bike climbs or vicious hill repeats, I would always remember with gratitude how it’s impossible for one to “swim uphill.” I mentioned this to a friend once, and she replied by saying that a negative current could have the same effect as uphill progression. False. Unless we’re talking about a rip current (in which case, you probably shouldn’t be swimming in it), currents are the silent ghosts of the sport, occurring clandestinely and insidiously, as silent and deadly as the wind. I made the mistake of checking my watch after far too little time. Close to 1 mile in (nearly halfway), my splits were way off my target pace. I was shocked. Having not raced many long distances this year, I started to accept the notion that perhaps I’m just not as fast as I thought I would be. I didn’t dwell on this little seed of doubt, but I did let it plant, and that was bad enough. Not long after that moment of reckoning, I lost Leslie. We came upon a pair of paddlers and a clump of slow swimmers got separated. I still saw her in the distance, closer to shore than I was, and she pressed onward in slow, steady rhythm. I lingered behind. I was also starting to get thirsty. And tired. The floodgates opened as every potential negative thought came rushing in. It’s that stupid run. I didn’t sleep enough. Didn’t eat enough. Didn’t drink enough. Maybe I’m just weak. 2 miles *is* a long distance. Good thing I still have 3 months until Ironman. Do I even want to do Ironman? Oh it kept getting worse. This is ridiculous. I’m training too much to race these days. I’m so mad at Coach Jim. I’m taking tomorrow off. I don’t want to race anymore. I don’t want to do Ironman anymore. I’ll withdraw and do it next year. My leg hurts. I’m thirsty. I’m really really thirsty. This is dangerous. This is how people die in the ocean. But the thirst was real, and worrisome in hindsight. I had put in two hard workouts the day before and have learned from experience that I can lose a solid 4-6 pounds of water in sweat. Thinking over my hydration habits over the previous 12 hours, there was no way I had regained that much fluid, and the effect was starting to take hold. I’ve been ocean swimming for about 4 years and have never ever been so thirsty. Splashes of seawater rolled down my throat and my tongue, against all logical reasoning, resorted to primal instincts, wanting to drink more. I thought about swimming to the paddlers and asking if they had water. I thought about swimming to shore and finding a fountain. But by this point, the Manhattan Pier was in clear sight, and distance left to swim was close to half a mile (which, on a moderate day, might the distance of a typical Tower 26 Wednesday swim course). I knew I could put in the work and get water at the finish line. But I still wasn’t thinking about the current. I will also say this — as awful as I felt, I knew that I wasn’t quite at the edge. Had I felt some of the more serious warning signs, I definitely would have withdrawn in the interest of safety. As depleted as I was, I wasn’t too far gone, and knew that I could finish what I started. My splits exploded as I approached the Manhattan Pier, and for the first time during the race, people did start to pass me. I wanted to put in a powerful final yards, but knew that such an effort wouldn’t be wise in my condition. I had seen my goal time come and go ages before. I had seen my previous rookie swimmer time fade away, and yet I was still swimming and didn’t know when I would be done. It was Sisyphean. The pier loomed beckoningly and yet never seemed to come any closer. Until it did. I rounded the edge, spurred on by the shouts of onlookers above. I started trickling down the line to shore, glanced behind me for waves, and finally dribbled onto shore. I jogged up the chute, passed the timing mats, and walked to the edge of the finisher’s tunnel. Once inside I found water and curled up at the edge of the pen. A kind volunteer kept checking on me and I assured him that I would be fine, as long as I could keep drinking. I drank a bottle, then another, and still felt thirsty but by then I could move again. I had no interest in post-race activities. I wanted to put on pants and get food. I managed to make it back to my car with my swim buddy Caritta—barefoot, nearly naked, and covered in sand—and from there we went across the street for celebratory pizza. I walked in, I saw another swim buddy and T26-er, Ash. For a moment I was shocked and almost looked behind to make sure I was the one she was speaking to. “Me??? ?” I asked. “You got first!” she said. The idea that I could have gotten first—especially after the performance I had put in—was unbelievable. And yet, I had. All of the negativity from the race started to fade as I realized that I must not have been the only one having a bad day if others had placed behind me, which Ash assured me they had. My finish time was wrecked, but, as Coach Gerry has since explained, it’s all about relative performance. Most people racing had gotten much slower than expected finish times. My much-too-slow time was still good enough! I’ve only just this year started to crack the podium in races, and rarely in events that featured more than a handful of participants in my age group. I’ve podiumed at 3 out of 5 of my previous races (3rd, then 2nd, and now 1st), but I tend to downplay it. 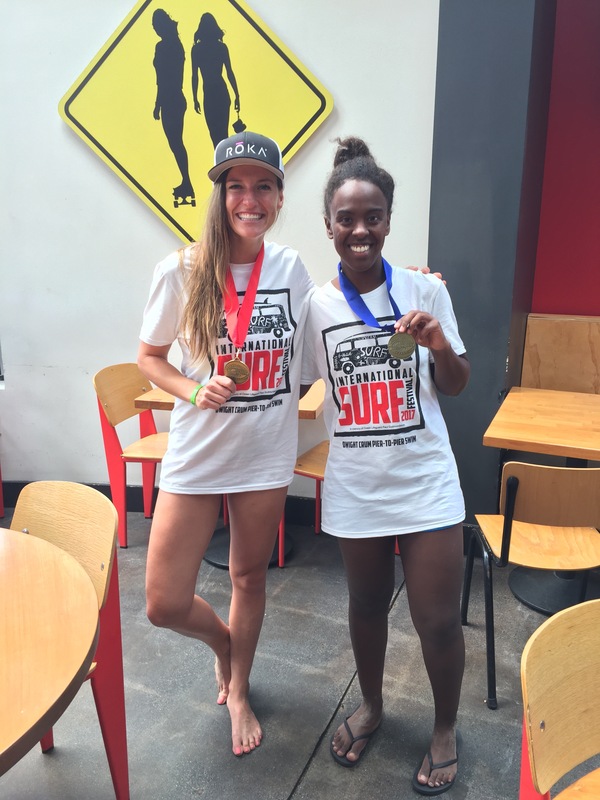 The truth is, it makes me uncomfortable to celebrate placing in a non-competitive age group (most women between the ages of 25 and 29 simply have better things to do than train and race). But I’m realizing that this way of thinking is also silly. The other piece of wisdom I hear is that you can only race who shows up, and if girls in my age group aren’t interested in putting in the work and showing up, then the ones who do and do it well deserve the accolades. So I’ve decided to lighten up. I hope that I do I have more podium finishes in this age group, and I plan to enjoy them.